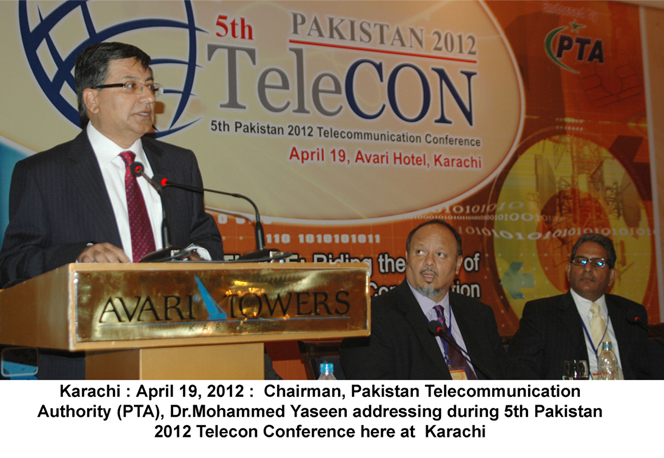 SHAMROCK Conferences International organized 5th Pakistan 2012 Telecommunication conference at Karachi. Chairman Pakistan Telecommunications Authority (PTA) Dr. Mohammed Yaseen was the chief guest on this occasion, while Mr. Menin Rodrigues, president & Chief Executive Officer, SHAMROCK Communication (pvt) Limited, IT & telecom industry experts, stakeholders, CEOs of telecom companies, academia and media representatives attended the seminar. On the occasion, Chairman PTA, Dr. Mohammed Yaseen said that, for launching 3G technology Pakistan is facing regulatory, technology and economic challenges. Chairman said that our market driving factors are high speed integrated and interactive services for which our cellular network is merging towards the 3G and Core and access networks towards IP and NGN Platforms. So this “convergence” can bring more revenue as expected of 5 billion to the country and more over better quality of services and cheaper services to the consumers will be provided. The regulator has to deal with maintaining QoS, Security and IP, numbering and interconnection, for these they have proposed various measures including regulators would be ready for ENUM so IP numbering will allow even more convergence and consumer rights would be maintained. Chairman also added that, according to the economic growth of Pakistan as given by World Bank knowledge assessment, Pakistan is ranked 117th out of 144. After these improvements, social and economic impacts on ICTs will highlight for every 10 points in Internet Penetration per 100 will be translated to 1.21 % GDP growth (World Bank). Other than this there are more business and entrepreneurship opportunities. Chairman, said that there is almost 185% growth in mobile internet users which clearly portrays the trend towards 3G. If we focus on its applications than broadband enhancing policy comes first which can trigger the multiplier effect with the economy. Public and private partnership is introduced which has both social and economic impacts e.g. health, education, transport, smart grid power line and Gas, and mobile banking. Increase in growth of mobile internet also shows increase in mobile broadband services which shows potential investment for mobile banking. He said that, we have set our goals like knowledge based Pakistan, E-Pakistan (E-govt, E-health etc) and more Government revenue and we are focusing on these goals but apart from technology inception there is more need of technology awareness in Pakistan like technology adoption in public sector. Our goal of seeing Pakistan as knowledge based society and economy will soon be achieved by this, Chairman further added. Mr. Menin Rodrigues, president & Chief Executive Officer, SHAMROCK Communication delivered welcome Remarks to the participants. During the seminar speakers of national and international fame focused numerous developmental challenges faced by Pakistan in the exceedingly competitive environment of telecom sector. The telecom experts (further) shared their wisdom and experience to draw tangible conclusions for ensuring rapid economic growth. They said that degree of success in Broad-based social uplift programs can be enhanced with the support of cellular connectivity. Through such modern solutions and effective programs, the underserved and under-privileged masses of the country, will gain financial freedom and social empowerment.